Looking for a USED ECLIPSE LV-DAF? The LV-DAF delivers fast, versatile autofocus with the Hybrid Auto-Focus system, making the most of two types of auto focus systems. Combining slit projection and contrast detection auto focus, it features large focus range and fast tracking ability. A variety of observation methods are supported, including brightfield, darkfield and differential interference contrast (DIC), as well as various transparent samples. Nikon Metrology, Inc. offers the most complete metrology product portfolio, including Coordinate Measuring Machines, Optical CMMs, 3D laser scanners, X-ray and Computed Tomography inspection systems, Large-Scale measuring machines, indoor GPS for tracking and positioning, metrology software and state-of-the-art vision measuring instruments featuring optical and mechanical 3D metrology solutions. These innovative metrology solutions respond to the advanced inspection requirements of manufacturers active in aerospace, electronics, automotive, medical, consumer and other industries. 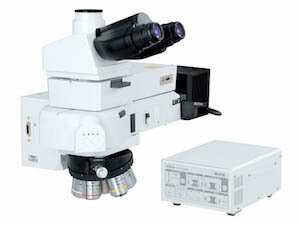 View more about Nikon Metrology, Inc. Looking to Purchase a New NIKON ECLIPSE LV-DAF?